It’s not just grunter, kob, shad, garrick and rock salmon to catch in the Umzimvubu down in Port St. Johns – Zambezi Sharks can also lighten up your day. Chuck any sort of live-bait out into that orange water and you don’t have to wait long for a voracious Zambezi pup to come in on the attack. They fight great and are beautiful in their innocent child like form, luckily they head out to sea when they grow up, or do they? Gavin Naude, fishing on the south bank near the main road bridge, a good few kilometres up the river, threw out a livie a few weeks back – and caught this cute little Zambi before too long. He hollered for a tag and Rob Nettleton did the honours – it weighed in at 65cm fork length, and was released with a nice little yellow tag to remember Gavin by. But then the next day, nearer the river mouth, someone got a 2m guy! It was a proper mean 2m shark and was also safely returned to the river. Evidently, it’s not just big momma’s coming into the river to give birth, but her teenage kids aswell?! Fishing with livebait for sharks at Port St. Johns also outs you in the running for one of these trophy kob. 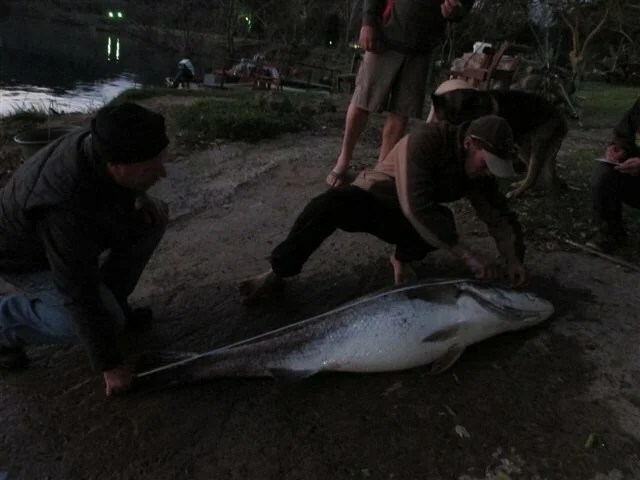 This one went about 60kg’s and was also tagged and released.